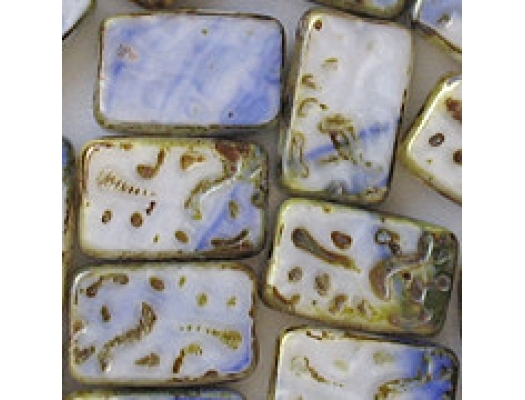 18mm long, 12mm wide, rectangles with polished 'windows' that have an embossed pattern (4-5mm thick). 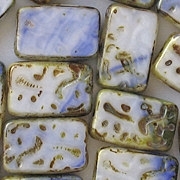 A mixture of white and opaque blue with a dark-brown picasso coating around the edges and in the grooves of the pattern. I eliminate seriously defective beads before shipping. I eliminate beads that have these defects: cracks; chips; deep or long scratches; unpolished or partially polished windows; and dimples in the corners that cause the corners to appear rounded. However, I don't eliminate beads that have these defects: small or shallow nicks or scratches; picasso coating on the edges of the windows or on areas of the windows where it doesn't normally occur; windows that have been over-polished so that most of the pattern has disappeared; ridges along the edges where some of the glass escaped the mold, if the ridge isn't uneven or very prominent; or dimples in the corners if the dimples don't cause the corners to be significantly rounded. (Large rectangular beads often have depressions on the sides near the corners which I call "dimples". They are a defect, but they are too common for me to eliminate all beads which have them.) These beads are too expensive to eliminate every bead that has a slight defect. They are very rustic in appearance, and many defects won't be visible or noticeable. You are always free to return beads for a refund if you feel I have allowed too many defects. This white/blue color combination isn't my personal favorite, but I thought some customers would like it. About the price: My price is very high because the supplier charges a very high wholesale price. The supplier is a small company, and to the best of my knowledge they are the only ones selling these beads in this country. 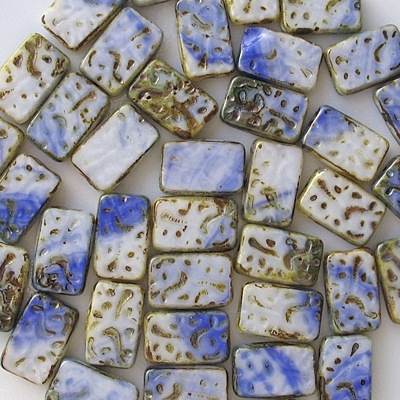 My markup on these beads is the same as for the less-expensive beads on the site.